The game of golf is inevitably comical. Seeing a pot-bellied antithesis of an athlete drop a club into position will prompt a chuckle from even the stuffiest square. Watching some guy miss an 18-incher and furiously hurl his putter from the green will make most players smile. Seeing some polo-clad Chubster muster all his strength only to trickle the ball to the women's tees is refreshingly hilarious. The misfortunes of others on the golf course have provided knee-buckling laughs since the beginning of the game. It is funny out there. Ample levity exists around every dogleg, with every chili dip and lipout, whether we want to admit it or not. So here's a few more chuckles from the realm of golf. It is an ode to those that love the game but don't take it or themselves too seriously. Laugh. Maybe even cry a little. Either way, enjoy. Down to Texas we go. River Plantation Country Club has received visits from a 12-foot intruder. No, it's not Ernie Els. An alligator has decided to make the underside of the River Plantation Drive bridge his new home. But calling this intruder unwelcome would be irresponsible, because neighbors seem to be taken with their new pet. The course superintendent reported that people were feeding chicken to the alligator, among other tasty sustenance. But the plot thickens. 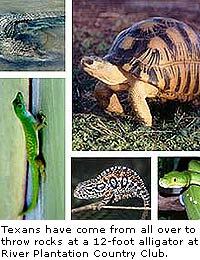 The County game warden has decided to simply let the animal be. At least until the lighting-quick 12-foot predator with vices for jaws and steak knives for teeth becomes aggressive. In addition, the creature has begun attracting the town's finest to come poke it with sticks and throw rocks at it. Reports stated that at one point, about a hundred people gathered to observe the beast, blocking off the golf course and leading us to draw one simple conclusion: There is absolutely nothing to do Montgomery County, Texas. On to Scotland and everyone's favorite portly Scot: Montie. Montie's marriage has been on the fritz for quite a while. He has told stories of roaming the streets at night in tears, lamenting his marital debacles. Eimear, mother of three, has also recently been reported to have cried into the shoulder of Hugh Grant, becoming very close to the bumbling Brit. Montie even stormed out of a tournament in China for what a spokesman deemed "personal reasons." Well, it seems that it may all be over. It has been reported that Montie and Eimear have announced the decision to divorce. The moody Chubster will now become a swinging bachelor once again. Turn-ons: looking for a woman that doesn't mind her husband being constantly gone and enjoys grumpy walks through the streets. Turn-offs: double bogeys, hecklers, Americans and everything else not included in the Turn ons. Now to delve into the business world. Scott Woodworth of Northern California knows the importance of a good pair of polka-dotted pants. 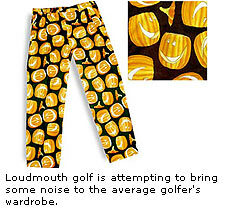 His company, Loudmouth Golf, specializes in making pants for the creative in a game criticized for its traditionally boring image. In Lake Tahoe last year, ex-NBA player Tom Tolbert was spotted wearing bright yellow pants with polka dots in a celebrity tournament. Dan Patrick of ESPN also dons Woodworth's creations. Woodworth is hoping to attract more players to the game by ridding some of its notorious stuffiness and emphasizing having fun. While we're with business, Clyde Beasley has made it possible to enjoy the links and not have to walk more than a few feet. And it has nothing to do with a golf cart. Beasley Creations presents table golf. 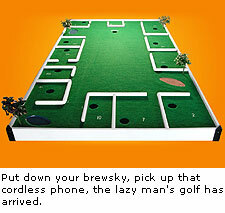 With appearances on the Wayne Brady Show and The Price is Right, table golf has taken the lazy by lackadaisical storm. The game is played on a pool table like billiards, and there are nine holes that weave around barriers that include fake sand traps and water hazards. Beasley could not be reached for comment because he didn't want to get up from the couch and answer the phone. On a more morbid note, Welsh golfer Chris Cousins was savagely beaten outside a night club. Cousins had qualified as a reserve for last year's British Open and was readying himself for U.S. Open qualifying this year. The University of Alabama student suffered a broken wrist, three fractures to the cheekbone, some memory loss, and stitches above the eye and in the back of the head. Celebrating his 21st birthday at the club, Cousins was mistaken for someone that had been kicked out earlier in the evening. Two moronic bouncers proceeded to pounce on him, beating him mercilessly before the mistake was realized. When reached for comment, the bouncers spewed incoherence while posing in front a full-length mirror wearing nothing but an American flag Speedo. To India. Hero Honda has taken measures to prove once and for all that money runs the world. Due to the lack of player participation in their Sunday Pro-Am, Honda has threatened to withdraw the PGAI's cut of 13 percent of the prize money if it is unable "to ensure and insist on top players' participation" in the event. If the pros do not show, Honda will seriously rethink its involvement with the Tour. Finally, we'll step from extreme greed to a touch of borderline insanity. David Feherty is funny. His timing and sense of humor border on dry comedic brilliance. 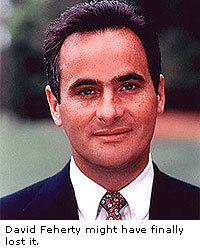 But the line between brilliance and insanity is blurred, and Feherty might have begun tipping over to the crazy side. Recently in an interview, Feherty, who once marked his ball with his room key, had this to say about Mickelson on Sunday at this year's Masters: "He forgot to shave on Sunday. He was too busy, too absorbed. He was watching a movie only he could see. Even when he started to hammer nails in his own coffin, he looked different. He didn't look puffed and goofy and sheepish and beaten." I think I speak for all when I say, Huh?